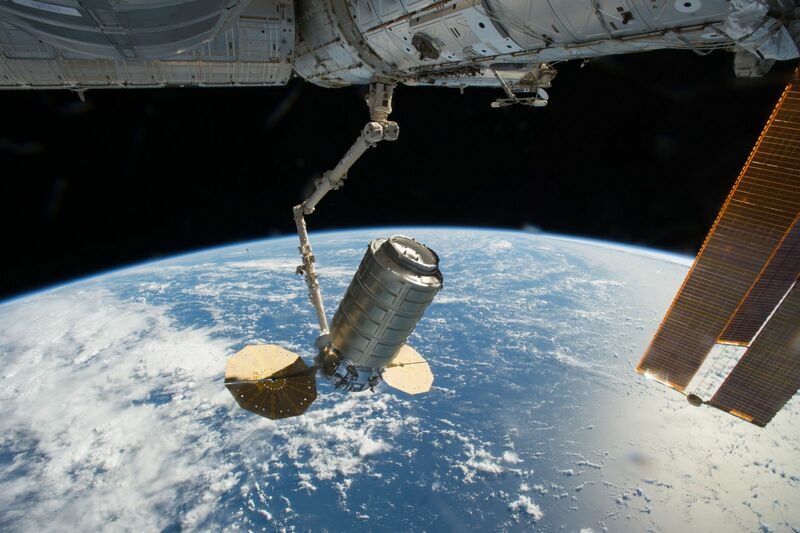 The S.S. Alan Poindexter Cygnus spacecraft successfully completed re-entry on Nov. 27 over the Pacific Ocean east of New Zealand following a month-long stay at the International Space Station. The mission, known as OA-5, marked Orbital ATK’s return to flight operations at NASA’s Wallops Flight Facility in Wallops Island, Virginia. In many ways, the flight of the S.S. Alan Poindexter was about one of the four ancient elements: fire. The mission got underway on Oct. 17 atop fire provided by twin RD-181 rocket engines. The spacecraft then provided the crucial test site for an experiment about flame propagation in space. Finally, it concluded with a fiery re-entry into Earth’s atmosphere. 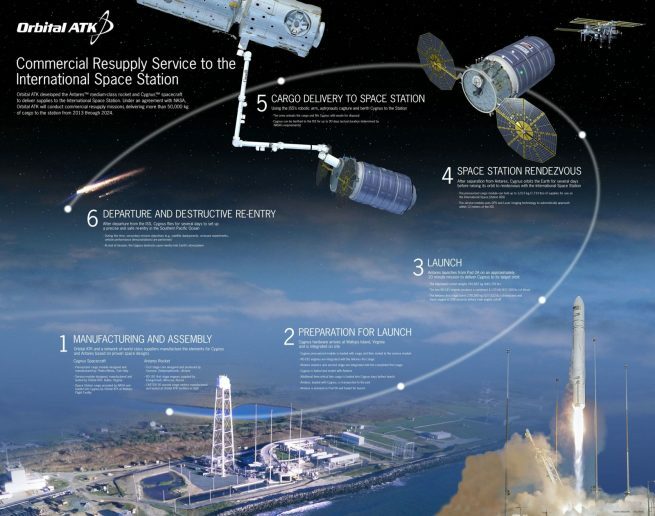 “The OA-5 mission was filled with numerous accomplishments,” said Frank Culbertson, president of Orbital ATK’s Space Systems Group, via a release issued by the Dulles, Virginia-based company. By all accounts, the new Antares 230 launch vehicle over-performed, leaping off the pad and into the darkening skies above Wallops Island at a staggering rate. Powered by two Russian-built RD-181 rocket engines, Antares was back at work delivering cargo to the space station by sending Cygnus cargo freighters into the silent ocean of space. 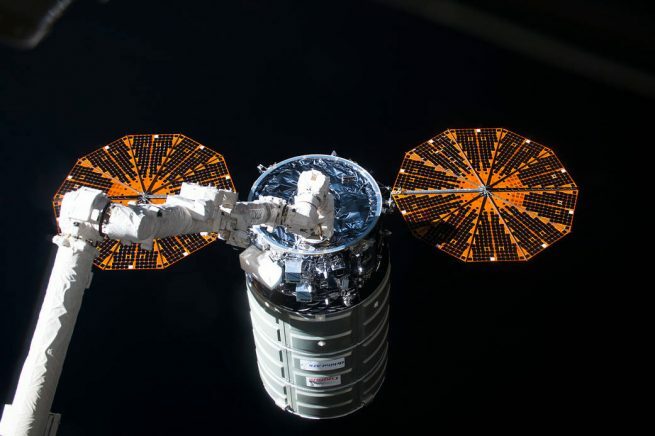 The cargo ship was the first Cygnus to be flown atop the Antares 230 variant rocket and the first to successfully use the Castor 30XL solid propellant upper stage for second-stage operations. “We returned to flight operations at our home base in eastern Virginia, successfully launched aboard our upgraded Antares rocket and once again showcased Cygnus’ dynamic versatility and value to serve as a platform for conducting science experiments and payload operations for key customers,” Culbertson said. The cargo ship unberthed from the Earth-facing port of the Unity module at 8:22 EST (13:22 GMT) on Nov. 21 when astronaut Shane Kimbrough used the robotic Canadarm2 to release the spacecraft. According to Orbital ATK, prior to departure, the Expedition 50 crew loaded the spacecraft with 2,469 pounds (1,120 kilograms) of items for disposal. “ISS received more than 5,000 pounds of equipment, supplies, and payloads, which put the station in great shape,” Kimbrough said following Cygnus’ departure from the outpost. On behalf of the Exp. 50 crew, he gave thanks to all who were involved with the flight. Five hours after the departure from the space station, Cygnus successfully started the Saffire-II payload experiment and deployed four CubeSats that will be used for meteorological research. OA-5 marked the first time a cargo spacecraft deployed satellites above the orbit of the International Space Station. The Spacecraft Fire Experiment-II (Saffire-II) is the second of a series of tests to study the behavior of large-scale fires in microgravity. It is the largest in-space flame experiment to be conducted in orbit. Cygnus controllers ignited a fire inside Cygnus’ pressurized cargo volume, which included material samples commonly found on the ISS. The test is designed to provide NASA with a better understanding of how fire works, spreads, and dies in the microgravity environment while exposed to various materials within a spacecraft. Results from the experiment will lead to technologies that will help astronauts traveling during deep space exploration missions, including the use of the Orion spacecraft. The experiment was designed by NASA’s Glenn Research Center and funded by NASA’s Advanced Exploration Systems Division. The research center is currently evaluating data and imagery gathered from the test. Following the Saffire-II experiment, Cygnus used a NanoRacks CubeSat to deploy four CubeSats into orbit. The spacecraft reached 500 kilometers before releasing the satellites into orbit. Orbital ATK named its spacecraft S.S. Alan Poindexter, after the former astronaut and Naval Aviator Captain who passed away from injuries sustained from a ski accident on July 1, 2012. Poindexter served 12 years in the United States Navy as an aviator and test pilot and logged more than 4,000 hours in 30 different types of aircraft. He was a two-time shuttle veteran serving as pilot on STS-122 and commander on STS-131. He logged more than 669 hours in space. Poindexter retired from NASA in December 2010. Orbital ATK is currently preparing for OA-7, the following mission under NASA’s Commercial Resupply Service-1 (CRS-1) contract. It is scheduled to launch in the spring of 2017 atop a United Launch Alliance Atlas V 401 rocket from Cape Canaveral Air Force Station’s Space Launch Complex 41 (SLC-41) in Florida. The company is under contract to deliver about 66,000 pounds (30,000 kilograms) of cargo, crew supplies, and experiments to the orbiting laboratory through 2018.